for my mother's birthday, i made her an 8"x16" theatrical backdrop for her figurines depicting the commedia dell'arte which she brought back from her trip to venice. 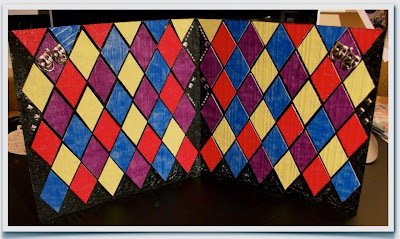 i sliced one spread of pages out of a black blank board book and covered it with tiles i painted and cut from patterned grungeboard. 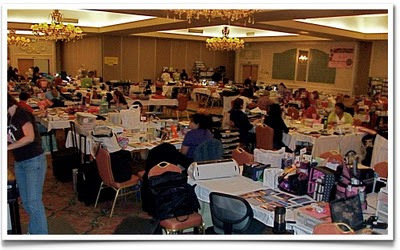 this weekend i taught some make-n-takes at the scraptacular getaway. i took this pic while most of the women were out to dinner...i can't imagine how noisy this room would have been with everyone in their seats! there was another smaller room across the hall for "focused scrappers" that was considerably quieter. 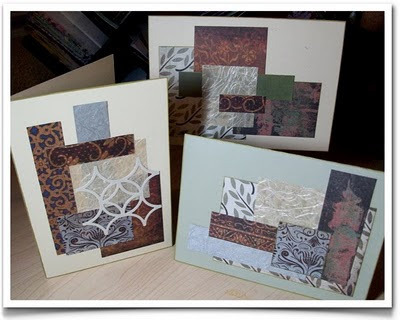 i shared some ways to make fun embellishments with lutradur for scrapbook layouts. i cut these hearts the old-fashioned way, by cutting a curve into a folded piece of lutradur. 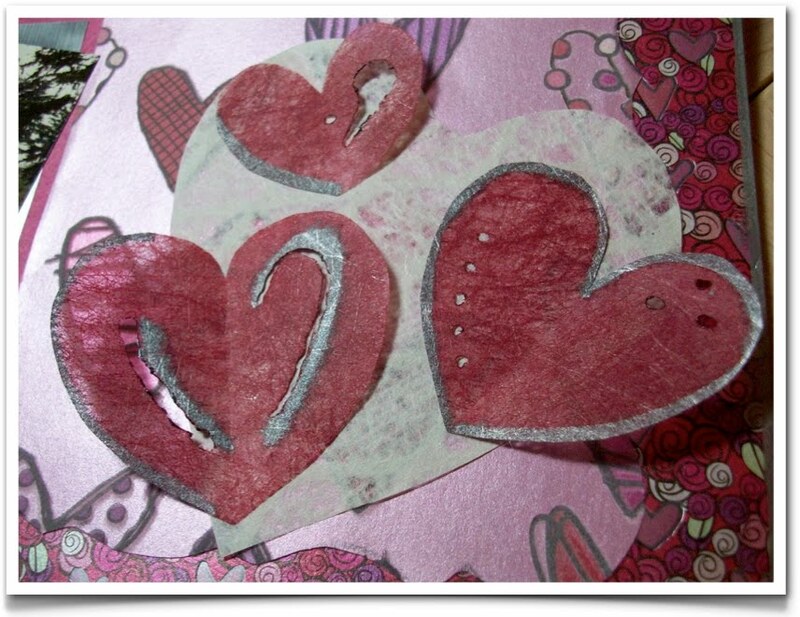 then i painted them red, burned away some areas with my textile tool, then highlighted with a silver leaf pen. 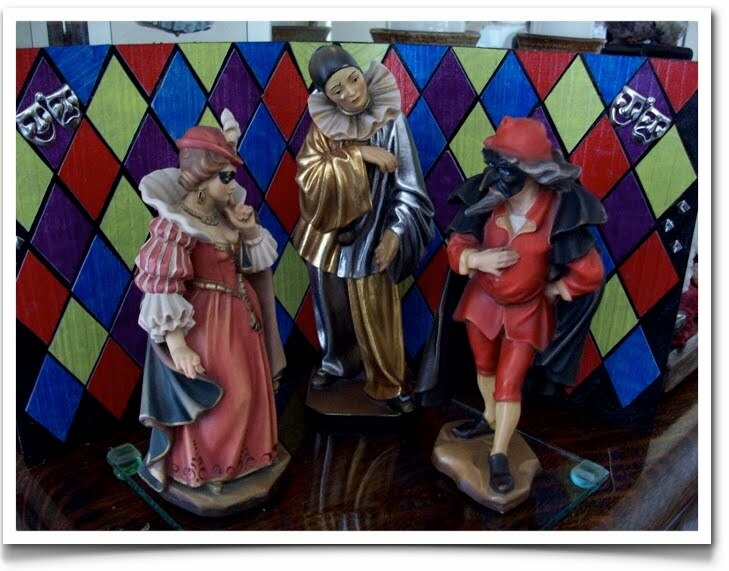 i'll share more ideas in my next e-newsletter, coming soon to an in-box near you! today i was a featured guest on cool2craft. 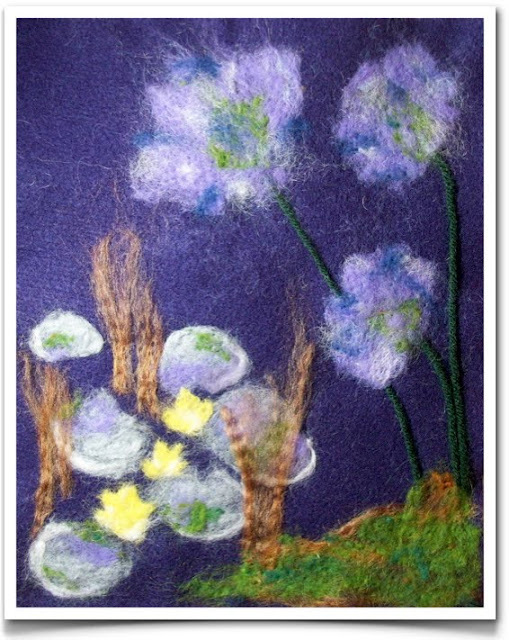 i demonstrated the basics of needlefelting - and shared how to "paint" with wool to create a scene on a piece of felt. 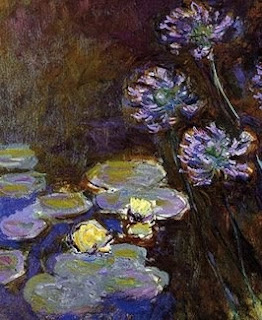 i chose an impressionist painting from monet as my inspiration, called waterlillies and agapanthas. now i just have to figure out how to work this little ditty (8.5x11) into a cool fiber art piece! my friend mary made a special request for some collaged greeting cards. i like randomly mixing and matching different patterns and textures like this. mary and i have been friends since the 7th grade...yikes, we're talking 35 years!! we are also part of a larger circle of girlfriends that have been close since junior high and high school...some of us even since grade school. we all live pretty different lives and we don't get to see each other very often...but when we do get together, it's just like old times. we used to have big slumber parties, or we'd all pile into one car to cruise the strip, there was lots of singing and dancing, loads of laughter, and some heartfelt tears too. we are planning a girl's weekend this summer and i can't wait to see everyone!